Become a member of the Fort Collins Figure Skating Club (FCFSC) and enjoy several great benefits. Improve your skills with free and reduced price club education sessions/workshops. We offer several on-ice and off-ice programs each membership year. 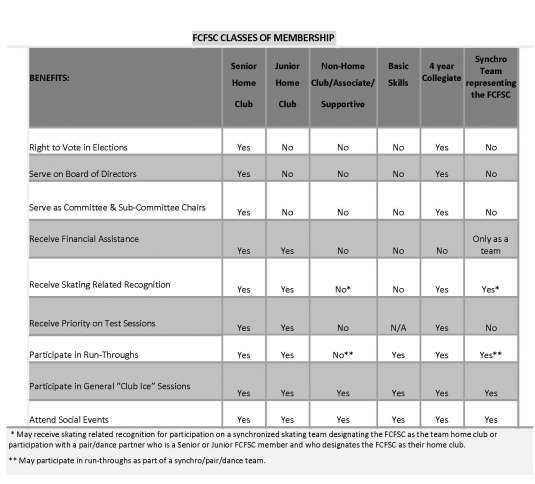 The FCFSC and USFS membership year is July 1 – June 30, and FCFSC offers various levels of membership. Please note that all levels entitle members to participate in social events, club ice, club education and will be on mailing lists for newsletters, seminars and receive club emails. Responsibilities: 20 volunteer hours are required for members in good standing. 30 volunteer hours are required of those households with more than one skating member. COLLEGIATE MEMBERSHIP FEES: This level of membership is designed for skaters who are currently college students at either a four year or a two year college. The membership lasts for four (4) years from the time of joining. This membership category is non‐renewable, so after the four years you must rejoin as a regular member. Collegiate members are eligible for testing, participation in club events, and USFS events. Collegiate members are not eligible for financial aid through Fort Collins Figure Skating Club. Proof of current status as a college student must be turned in with the membership form. BASIC SKILLS MEMBERSHIP FEES: (Basic Skills membership year: July 1 – June 30) (Basic skills and Learn‐to‐Skate class members only). Eligible to participate in Basic Skills Events only. Not eligible for testing. No voting rights, cannot run for the Board and not eligible for Club awards or grants from the financial aid fund.) . SUPPORTIVE MEMBERSHIP FEES: For supportive, non‐skating members of the Club. No additional benefits apply. No voting rights and cannot run for the Board.